Until now, the Department’s primary focus was to determine whether states were meeting procedural requirements such as timelines for evaluations, due process hearings and transitioning children into preschool services. 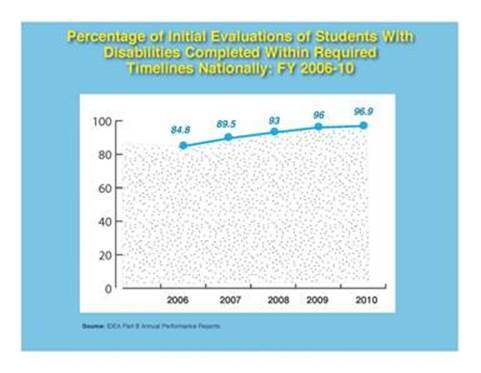 While these compliance indicators remain important to children and families, under the new framework known as Results-Driven Accountability (RDA), the Department will also include educational results and outcomes for students with disabilities in making each state’s annual determination under the Individuals with Disabilities Education Act (IDEA). The Department has worked extensively with states to ensure meaningful access to special education and related services for students with disabilities and has noted significant improvements in compliance over the last several years. However, educational outcomes in reading and math, as well as graduation rates, for students with disabilities continue to lag. 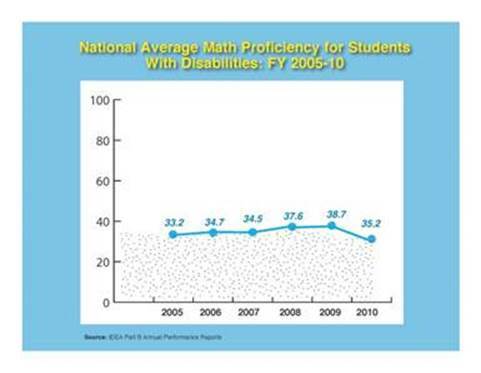 With this year’s IDEA determinations, the Department used multiple outcome measures that include students with disabilities’ participation in state assessments, proficiency gaps between students with disabilities and all students, as well as performance in reading and math on the National Assessment of Educational Progress (NAEP) to produce a more comprehensive and thorough picture of the performance of children with disabilities in each state. This change in accountability represents a significant and long-overdue raising of the bar for special education. Last year, when the Department considered only compliance data in making annual determinations, 41 states and territories met requirements. This year, however, when the Department includes data on how students are actually performing, only 18 states and territories meet requirements. IDEA requires the Department to make annual decisions for states in four categories: meet requirements, need assistance, need intervention, or need substantial intervention. Under Results-Driven Accountability, the Department has made the following determinations for this year based on 2012-13 data. If a state needs assistance for two years in a row, IDEA requires the Department to take actions such as requiring the state to obtain technical assistance or identifying the state as a high-risk grant recipient. Should a state need intervention for three years in a row, IDEA mandates that the Department must take specific actions, which can include requiring the state to prepare a corrective action plan, enter into a compliance agreement or, ultimately, withholding a portion of the state’s funding. As part of the move to RDA, OSERS will fund a new $50 million technical assistance center – the Center on Systemic Improvement – to help states leverage the $11.5 billion in federal special education funds which they currently receive to improve outcomes for students with disabilities. In addition, OSERS will be working with each state to support them in developing comprehensive plans designed to improve results for children with disabilities. IDEA requires the primary focus of federal and state monitoring to be on improving educational results and functional outcomes for all children with disabilities and ensuring that each state meets the program requirements under IDEA. In particular, the law places an emphasis on those requirements that are the most closely related to improving educational and early intervention results for children with disabilities. For more information about today’s announcement, including graphs, state fact sheets and letters, as well as the work of the Office of Special Education and Rehabilitative Services, click here.